During March 2008 a small-scale salvage excavation was carried out in a private building plot, located at the southwestern edge of Moshav Allonēy Abba (Permit No. 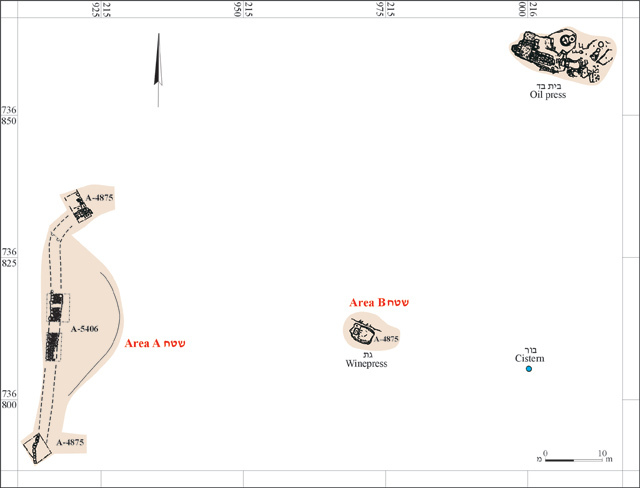 A-5406*; map ref. NIG 215913/736812; OIG 165913/236812). The excavation, on behalf of the Antiquities Authority, was directed by Y. Alexandre, with the assistance of Y. Ya‘aqoby (administration), T. Meltsen (surveying) and workers from Yafia‘. Archaeological remains were discovered in the course of earthworks carried out for the construction of a new southern neighborhood in the Moshav. Previous excavations in this area (Permit No. 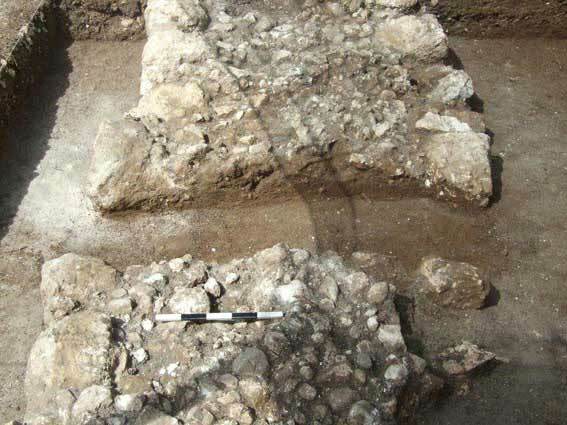 A-4875) revealed a Roman-period industrial oil press (Area C), a winepress (Area B), as well as a terrace wall and an unidentified row of stones (Area A). These archaeological remains indicated that an industrial agricultural processing area existed here in the Hellenistic and Roman periods (Fig. 1). Two squares (4 x 5 m each) were opened in the present excavation, after a row of large stones was exposed in probe trenches dug by mechanical equipment. It was surmised that the current row of stones could be the continuation of the line of stones uncovered in Area A. Two parallel rows of large single stones, which ran the length of both squares, had a single layer of packed small stones between them (L102, L105; Figs. 2, 3). The overall width of the paved area, including the bordering stones was c. 2 m, and the exposed length of the path, including the balk, was 12 m. The large stones were of varying sizes (c. 0.4 x 0.5 m, height 0.3 m) and some of them were roughly worked on their outer side to form a fairly straight line. Several of the large stones were missing, no doubt due to intensive agricultural activities in this area over the years, and several of the extant stones were pushed out off line. Likewise, the small-stone layer was uneven, with gaps in the coverage. A section (L106) was cut through the width of the paved area to establish its makeup, whereby it was clear that no makeup layers occurred below the small stones (Fig. 4). No evidence for mortar or any other bonding material between the stones was found. Packed earth (L101, L103, L107) that contained a few stones was on either side of the path. The ceramic evidence was extremely limited and included not a single diagnostic rim fragment. The few small worn potsherds found amongst the stones could be dated to the Roman period. The uncovered remains seem to be part of a paved path from the Roman period. The width and the simplicity of construction do not allow this element to be considered a proper road. Once the path was measured and drawn it became clear that the row of stones in the south square of Area A, exposed in the former excavation, was part of this path southern extension. A couple of stones visible in the section of the building plot to the north of the present excavation could also be linked up with the path, forming part of its northern extension. The terrace wall uncovered in the former excavation (Area A, northern square) may also have been part of the path, although this is uncertain due to its bad preservation. 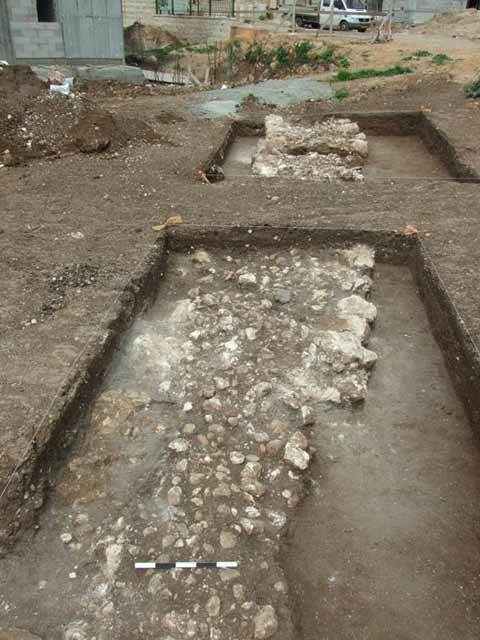 If all these components are joined up, the overall length of the paved path would be c. 100 m. It is unclear from the evidence as to where the path led; it might have linked up with the olive press on the hill, c. 17 m to the east. 1. Plan of excavated areas. 2. Paved path, plan and section.